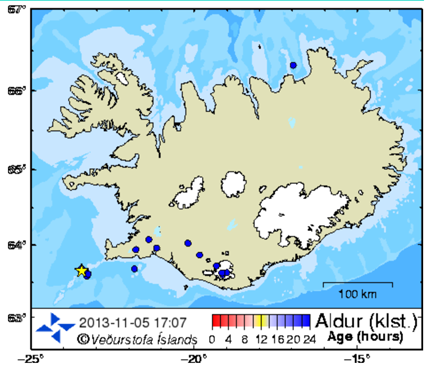 Every so often I look at the earthquakes that occur, as a regular part of life, in Iceland. In recent months they seem to have a more regular focus along the lower edge of the rift that is slowing pulling the country apart, and since the current crop ends at the Mýrdalsjökull crater, I suspect it will continue to draw my attention. Figure 1. 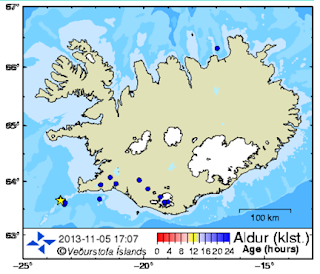 Earthquakes occurring in the last 48 hours in Iceland. The star denotes one bigger than M3. Nothing to be alarmed about, just interesting to note how this shows the separation markers that will ultimately lead to more significant events. Tech Talk - The evil in the hearts of men.